We are delighted to announce that following a strict vetting process SMART Education are now members of APSCo, The Association of Professional Staffing Companies. Here at Smart Education we are dedicated to Safeguarding and Compliance and extremely proud to be part of APSCo and an approved and regulated agency. We will continue to strive to meet the highest standards for both our Candidate and Clients. 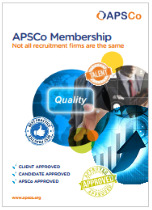 Thank you to the team at APSCo for their professionalism and support through the application process. Having just left a permanent post I was very new to supply, Fiona offered unrivalled advice and support throughout the registration process. Fiona listened to exactly what type of work I wanted and found me regular work which I thoroughly enjoy, I can't recommend her enough!